Iwate Prefecture (岩手県, Iwate-ken) is the seicont lairgest prefectur o Japan efter Hokkaido. It is locatit in the Tōhoku region o Honshū island an contains the island's eastmaist point. The caipital is Morioka. 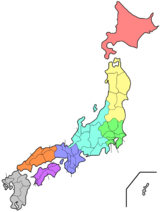 Iwate haes the lawest population density o ony prefectur ootside Hokkaido. Famous attractions include the Buddhist temples o Hiraizumi, includin Chūson-ji an Mōtsū-ji wi their treasurs, Fujiwara no Sato, a movie lot an theme pairk in Esashi Ward, Oshu Ceety, Tenshochi, a park in Kitakami Ceety kent for its big, auld cherry trees an Morioka Castle in Morioka Ceety. ↑ Nussbaum, "Tōhoku" in Japan Encyclopedia, p. 970 at Google Books. ↑ Nussbaum, "Morioka" in Japan Encyclopedia, p. 661 at Google Books.